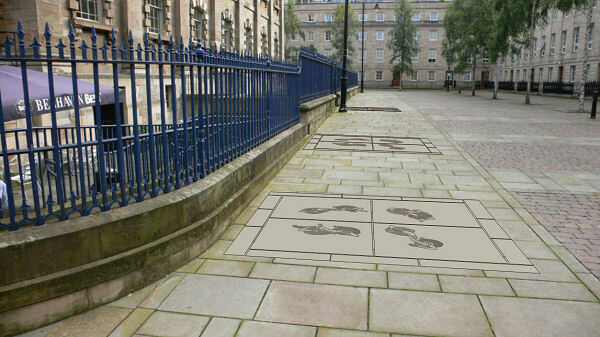 This project called ”Wee Folk Dancing”, is a concept to create a series of sandblasted sandstone inlays surrounding the former church, St. Andrews in the Square. This was intended to be the first of a series of works using this theme to be developed within Glasgow. However, since beginning working on this project, I have completed a stone mosaic forming the entrance walkway for Oran Mor, in Glasgow’s West End. This is a unique Scottish Project. The forms and gestures of Scottish Traditional Dancing have a very high recognition factor internationally. 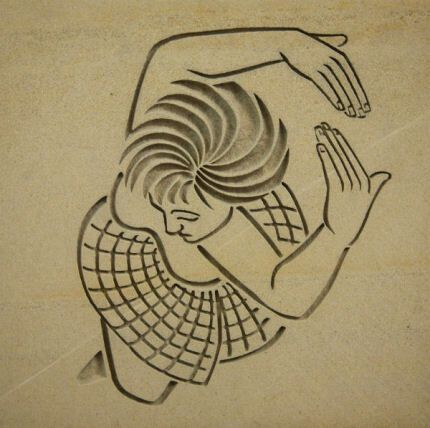 The theme of the dance is given a totally new identity by using the perspective of viewing from above and therefore any images on the ground are seen from the natural viewpoint. This idea originated during the project for the Piping Centre in Glasgow. 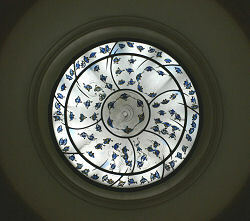 In addition to the main concept for the building, I was asked to design a small stained glass roundel for the cupola above the staircase. It was to have a sense of fun and I created the idea of showing a dance in progress using some of the formations of that dance. This idea has been widely praised and enjoyed encouraging me to further explore this theme. This small window was completed in 1997, now 10 years ago, an appropriate time to move to the next stage. After 10 years of working sporadically on this theme, I decided to rework and revise the complete concept using digital methods allowing me a far greater flexibility in design, composition and scale. I had a discussion about this concept with the architect, Gerry Grams In 2006. He had been the main Architect for The Piping Centre and has been aware of this idea since then. He arranged a meeting with Liz Davidson of the Merchant City. She passed me on to Tom Laurie and Veronica Low of St Andrews in the Square, The Scottish Centre of Culture, all concerned were immediately enthusiastic about the concept. After a few discussions and a meeting at St Andrews in the Square, it was decided that I should try to define a concept and location specifiacally for this building. 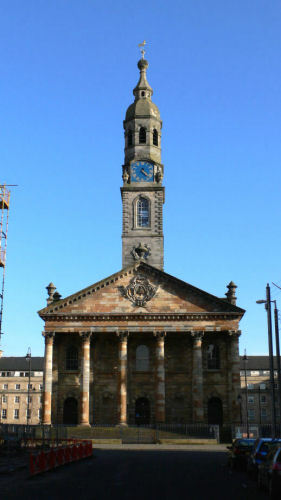 For the inauguration of the former church as the Centre for Scottish Culture, a dance was created ”The St Andrews in the Square Jig”. This dance was obviously the dance for the project for this site. I have looked at more traditional dances such as the ”Eightsome Reel” and the ”Dashing White Sergeant”, both of which I have designed using this method, but I decided to interpret ”The St. Andrew’s In the Square Jig” and to look at how it could best be used in this location. I was given the choreography of the dance by Tricia Wilson, the woman who composed it. She had arranged that it be performed for me in the building. Once I had seen the dance, I saw how it could be used to enhance this building and to launch this concept. The proposal has been warmly and enthusiastically accepted by the City of Glasgow. I hope that this project can be completed and installed before the end of 2008. This photograph shows a sample and demonstrates how the images will be applied to the stone slabs. The sandstone used will be selected to match the existing stone at the location so that the art work will blend in harmoniously after aging. 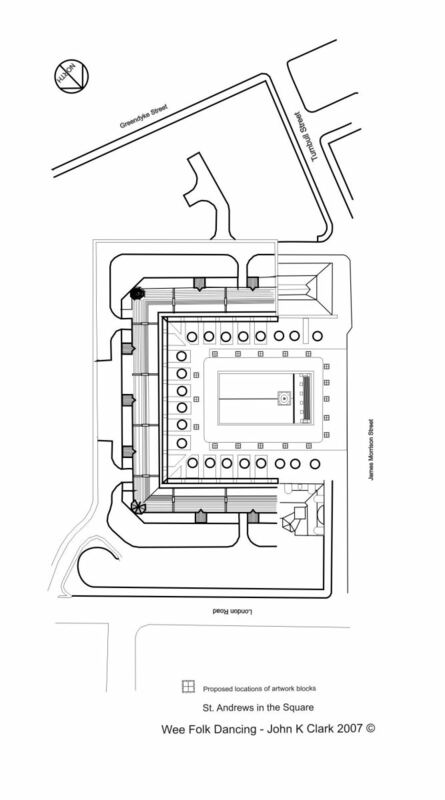 This plan view of the location shows how where I propose to insert the 18 stone inlays. There will be 18 positions as indicated on the plan. 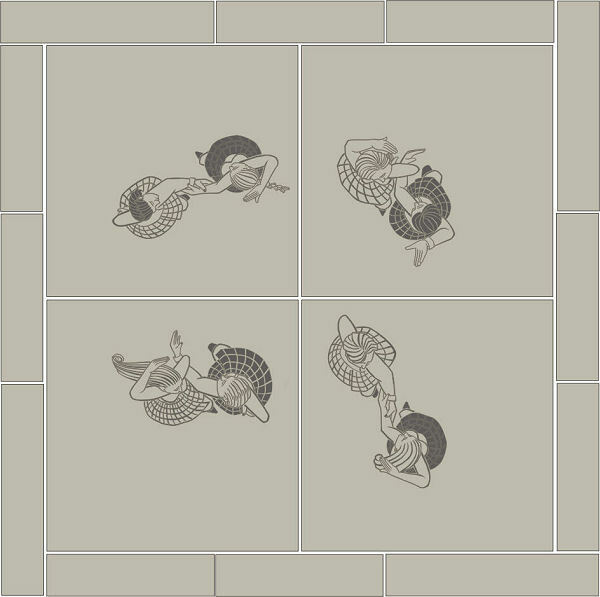 Each of the positions illustrates a movement in the dance. Each position will be made up of 4 sandstone slabs 900mm x 900mm with a border of the same stone 150mm wide. This detail shows one of the eighteen sections. The same group of figures are seen throughout all 18 stages of the dance. This mock - up shows how the sections will be inserted into the various locations surrounding the building. This project was planning consent in August 2008. The project will be joint Funded by Glasgow City Council. The greatest part of the costs are for the making and the laying of the stones. My costs have been held to a minimum. This underpins my own interest in seeing this concept realized and launched. I have been working with this concept for 10 years, over the last year very intensively. The linking of the individual or a company to this unique concept and the publicity benefits and positive image that sponsoring a high quality work within the city would bring. The sponsors will of course be acknowledged within the style and the main part of the work. For example, a logo and company name sandblasted into a suitable stone within the project. It has been seen and acknowledged that this idea could well turn into an ongoing motif integrated throughout the city adding to the already rich arts infrastructure of Glasgow. Apart from the obvious tourism interest in such a unique Scottish concept, there is the fact that it is a durable work of art within the public domain and therefore accessible to all. The project is focusing on an internationally recognized aspect of Scottish Culture which, in many ways, has not been celebrated. From the reaction of those who have seen this work in progress, I am convinced that this project will be greeted with pleasure and delight and will add another facet to the jewel that is Glasgow.